Wild annual sunflower - Helianthus annuus (I love it when the scientific names make sense). The state flower of Kansas. The subject of my doctoral dissertation research. For the rest of this week I will be sharing with you facts about sunflowers, bits of my doctoral research, and pictures - lots of pictures. I think I may have more pictures of sunflowers than anything else, except our cat. Sunflowers are in the plant family called the Asteraceae. This is one of the biggest families of flowering plants. In this family, what we refer to as a flower is actually a composite of smaller flowers clustered together (an old name for this family is the Composite Family). You can get a sense of that from the following picture. Each of the brown tubes is a stigma (the female part of the flower). Each flower has a single sigma. So you can see that this one "flower" (more properly termed an inflorescence) is actually made up of hundreds of true flowers. Some of the flowers have petals (ray flowers) and they occur at the edge of the inflorescence. Most of the flowers in an inflorescence do not have petals. They are called disc flowers. The inflorescence on the left had already dropped its petals and the seeds are beginning to form. The one on the right still has its petals. The wild sunflowers that I study is the same species as the cultivated variety used for sunflower seeds and oil. All of my pictures are of wild sunflowers. There are morphological differences between the wild and cultivated varieties. Wild sunflowers have several inflorescences per plant, while cultivated varieties (at least those used for crops) only have one. The inflorescences and the seeds of cultivated varieties are much larger than those of the wild types. Tomorrow: the story of sunflower cultivation. We love sunflowers! and so do the birds...any seeds missed by them and the kids, reseed themselves for gorgeous sunflowers every summer here. Thanks so much Pat. 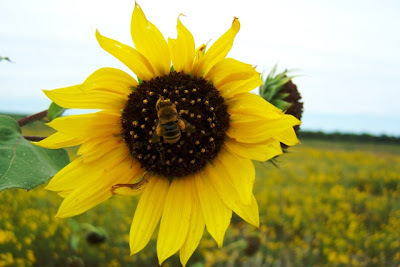 I have to say that the first picture in this post, the one with the sunflower and the bee, it is my favorite picture I have taken so far. I may be biased, but I think it is difficult not to like sunflowers. That said, I will be discussing the "darker" side of sunflowers in a few days. 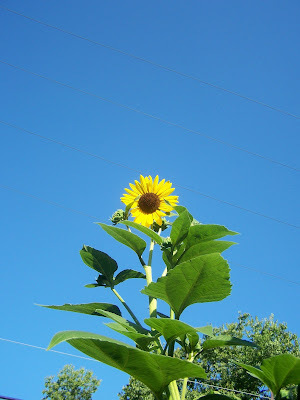 I miss my sunflower yard! Your photos are just beautiful. The bee on the sunflower is so cute!